A Natural Dyeing Workshop led by Susan Martin was held at the Trust today, and an enjoyable event it was. 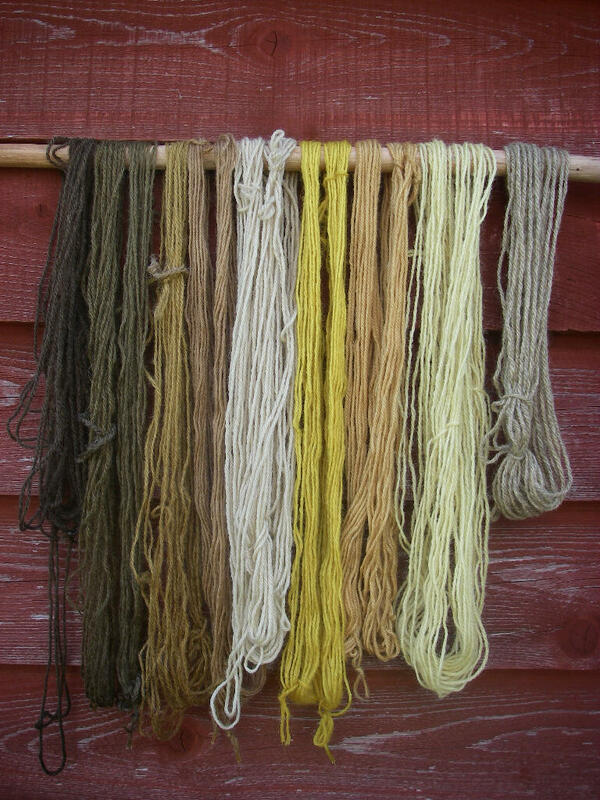 Susan took us through the whole process of dyeing, including mordanting the wool so that the dyes will fix, collecting seasonal dye plants, making a dye bath and dyeing the yarn. After an introduction to the subject we set up a lichen dye pot, using fallen lichen that had been collected over the winter (see here). Lichen is a substantive dye, and does not need a mordant to be fast. We used the traditional method of layering equal weights of lichen and hanks of wool in a pot, which is then covered with water and bought slowly to a simmer. While the lichen pot simmered, we went on a forage to see what other dye plants we could find. We collected ribwort plantain (Plantago lanceolata), docks, nettles, Dyers Camomile (Anthemis Tinctoria) and Tansy (Tanacetum vulgare). Susan had also bought along some walnut leaves. Susan showed us how to make dye baths by boiling up the plant material collected for varying lengths of time. We then dyed small hanks of wool to see what colours we would get. The star of the day was the Dyers Camomile, which produced a rich golden yellow. The Tansy was lovely too, producing a pretty pale primrose yellow. The Walnut produced a strong yellow-brown, which became olive green when the hanks were after dipped into iron water. The lichen produced a rich tan brown, which could be made stronger by longer simmering. We were all impressed with the range of colours produced and how well they harmonised together. I am looking forward to exploring natural dyes further. 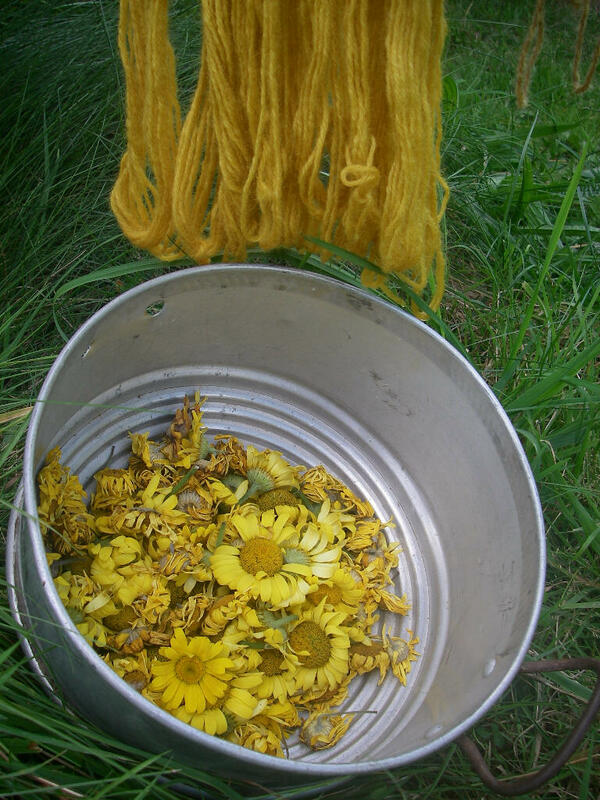 This entry was posted in Courses, Dyeing with Plants and tagged dyers camomile, Lichen, natural dyeing, tansy. Bookmark the permalink.